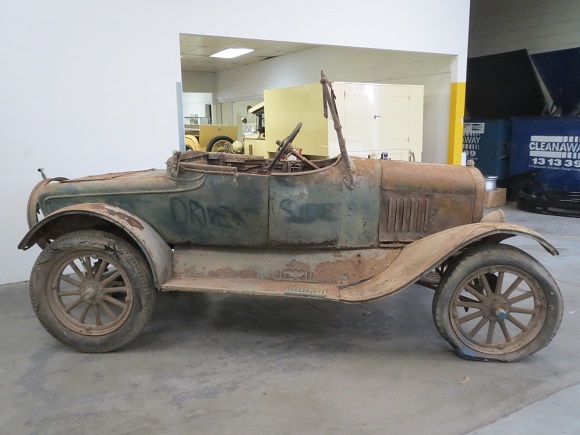 Model T Ford Forum: Barn Find - 1925 Duncan & Fraser Limted "Deluxe" bodied roadster from Tumby Bay. 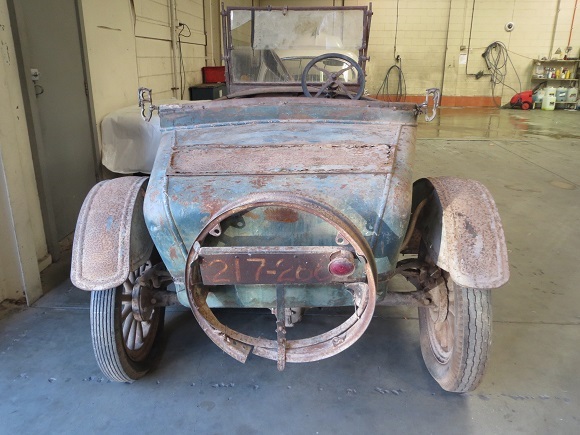 Barn Find - 1925 Duncan & Fraser Limted "Deluxe" bodied roadster from Tumby Bay. 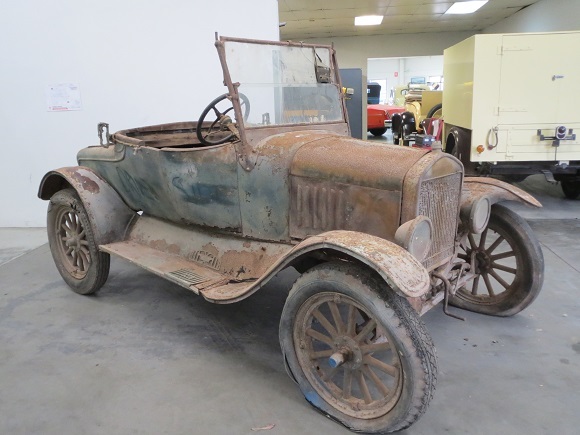 Model T Ford Forum: Forum 2014: Barn Find - 1925 Duncan & Fraser Limted "Deluxe" bodied roadster from Tumby Bay. After the disastrous fire on 21st February 1923 (see www.duncanandfraser.com) the emphasis was on making standard bodies for Duncan Motors and selling standard cars. However, they did return to “deluxe” body manufacturing on Fords. I have 2 photos from the Duncan Family from the immediate post fire period dated 1923 which were published in my book and were the first evidence of this. They clearly showed, amongst other details, a new 3 bolt windscreen mount rather than the 2 bolt mount used since 1911. It was with much excitement that On Thursday 5th June I was able to visit a car that had turned up with Garry Rainsford, a classic car dealer here in Adelaide. Garry told me the car came from a family in Tumby Bay, over near Port Lincoln in South Australia where their grandfather bought the model ‘T’ new and was the local doctor. He was told it was a 1925 and placed the Ford for sale. Post fire Duncan & Fraser Ltd. “deluxe” bodies are rare. Until this Tumby Bay car I knew of only one other. Ironically that too is a roadster. We know so little about these rare cars, and I have hundreds of points if interest for my study on Duncan & Fraser. Upon seeing this car it very quickly becomes obvious it has been together for a bloody long time. I was looking to see if earlier roadster features were on this car including the steering bracket wedge, the steering column wedge, the fuel tank mounted behind the seat, a body number, and the customary modified mudguards to take wooden ruining boards covered in linoleum trimmed in nickel. The engine number is C519563, casting date 28-?-B. The month is unreadable, but looks a single digit. It is a non rear mounting block, that is not 26-27, 4 dip sump, interestingly the pedals are smooth like a Dalgety. The chassis is pressed, square springs etc. Nothing here that is really date worthy. The wheels are noteworthy though and are 4.50 x 21” split rims. The wheels don’t seem to be add-ons, are painted body colour and are a full matched set including the spare. Although I have no evidence like an old registration label, everything lines up and I think this is a genuine, unmolested early 1925 car. C519XXX is a January 1925 build according to my lists. C517615 is 1st January 1925 as supplied by the “Ford Times”. Allowing 6 weeks for shipping to Australia, we are looking at a March build, at the earliest. If so, we are possibly looking at one for the very last Duncan & Fraser Ford bodies just before or around the inception of Ford Australia and French in March 1925. This is definitely the latest Duncan & Fraser "deluxe" body I have ever seen. The 3 bolt windscreen mounts are intact. Interestingly standard Duncan Motors windscreen stanchions and frames have been fitted utilising standard parts. A dashboard is fitted, and whilst this was an accessory on some earlier "deluxe" bodies they became standard with the electric starter and ignition switch. The fuel tank, in this case oval, is mounted behind the seat up if front of the turtledeck. It uses standard Ford tank brackets, but mounted on wooden risers to lift it as high as possible in the turtledeck. The central spout is still complete. The firewall has had the Ford steering column mounts and central hole welded and a new hole cut lower down. The wedge was still under the steering bracket. A wooden spacer block is fitted between the column base and the firewall to take up the angle difference. In this car an earlier wooden firewall column with the round base is still being used. The running boards still remain wood, covered in linoleum and trimmed with nickel plated trim. The mudguards still remain modified with welded plates added at the feet to support the use of a wooden running board. Door Sill Plates – this one was very interesting as I expected to see the badges. What I did not expect was the rough and unfinished way in which they were made. Although still photo engraved and made of German Silver like all other sill plates, they have been just hand cut out, holes punched for nails and fastened to the body. Every other plate I have seen have been finished off, smooth edges, radiuses, nail holes properly drilled with space for the heads etc. These are just hand cut and very poor in comparison to earlier ones. Body Number – alas I could not find a body number on this old girl. I looked everywhere; under the seat, under the rear mudguards, in and around doors and sill, floor board risers like a Tarrant, under the doors, anywhere I could think of. Nothing. Colour – the whole car is painted a mid blue including mudguards, valances and wheels. The colour is very similar to Scoorgie’s 1925 Coupe. All fittings are nickel plate such as the head light rims, radiator shell etc. but the windscreen mounting brackets, stanchions and frames are all black. Only the mounting nuts are nickel plated. Overall we have a rare, unmolested find at the crucial point at the formation of Ford Australia. She has answered many questions, and of course raised many more. I have no financial or commercial interest in this car being for sale, but I do sincerely thank Garry Rainsford for allowing me unlimited access to photograph this rare and exciting car. I truly hope it finds a genuine and loving home that will restore her for what she is. David -- I read through your entire initial post and was disappointed that it did not end with, "The car now resides in my garage." Excuse the word "patina" again but that is the best. Besides the graceful flowing lines on that body the colors and texture are fantastic. Humor me while I get my brushes and paints out. What a great piece of Duncan & Fraser history and Ford automobile history in Australia. I hope you have some additional photos and can clarify a few questions to help us better understand the car. 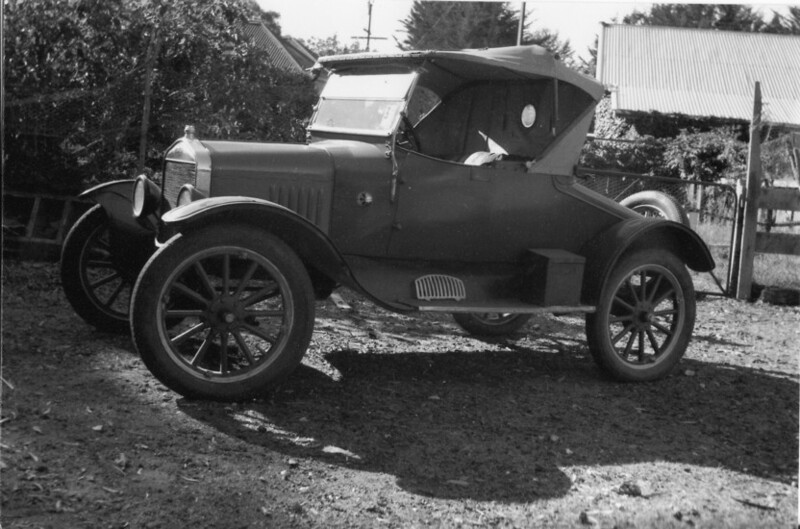 For those that may not remember the 3 seat 1913 Duncan & Fraser roadster please see: http://www.mtfca.com/discus/messages/331880/409717.html and scroll almost half way down to Bob Trevan’s restoration photos and then a little later early photos from back in the day of the same car. 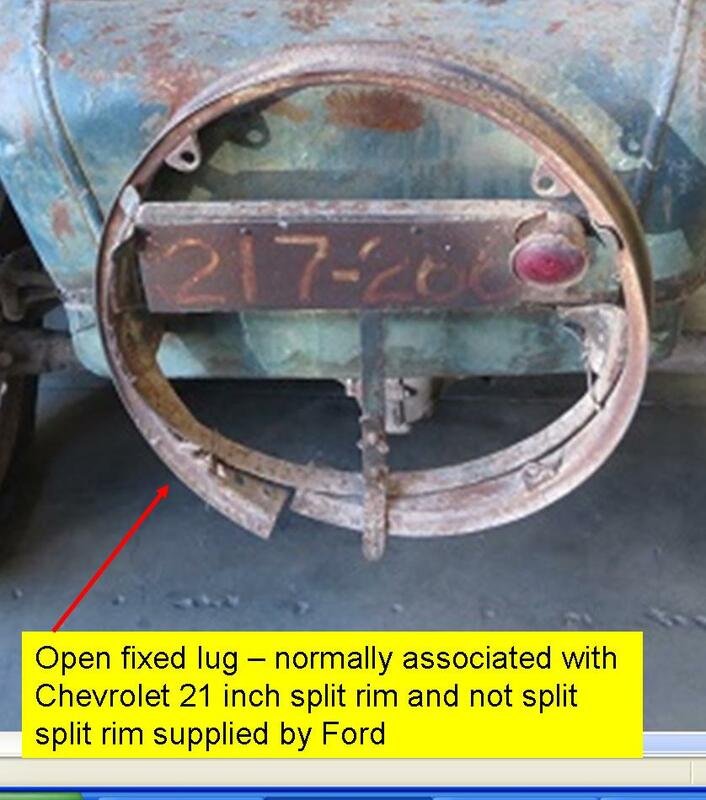 David, can you please verify what type of lugs are holding the 21 inch demountable rims onto the wheels? From the photos I cannot tell for sure – I would suspect loose lug Kelsey style rims and wheels but from the photos and my eyes I cannot tell for sure. The Canadian 21 inch demountable rims were supplied in both lose lug and fixed lug. 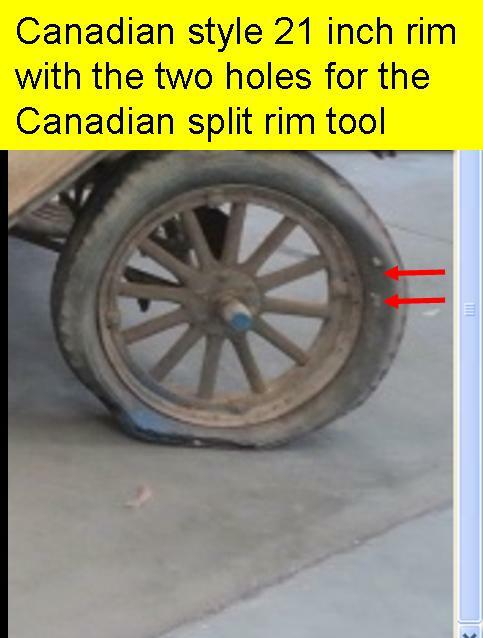 Clearly the rims are the Canadian style 21 inch with the two holes on each side of the rim (four total) for the special Canadian split tool. I believe Trent Boggess originally posted the photos below and they have been reposted several times over the years. They are the Canadian split rim tool that fits into those holes in the sides of the 21 inch Canadian Split Rim (both loose lug and fixed lug rims). 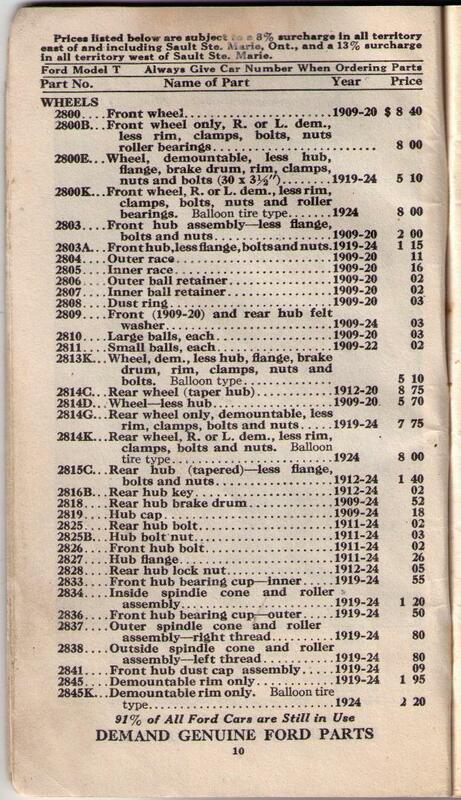 And not as easy to read is page 14 from the 1926 Price List of Parts which was provided by Allen Peters. It notes the over lap of fixed and loose lug 21 inch balloon rims. So either could have been used on a 1925 car. Clearly a very desirable body and car. I hope it can be narrowed down a little more as to 1924 or 1925 but either way it is a great find! Thank you again for sharing the information with us. 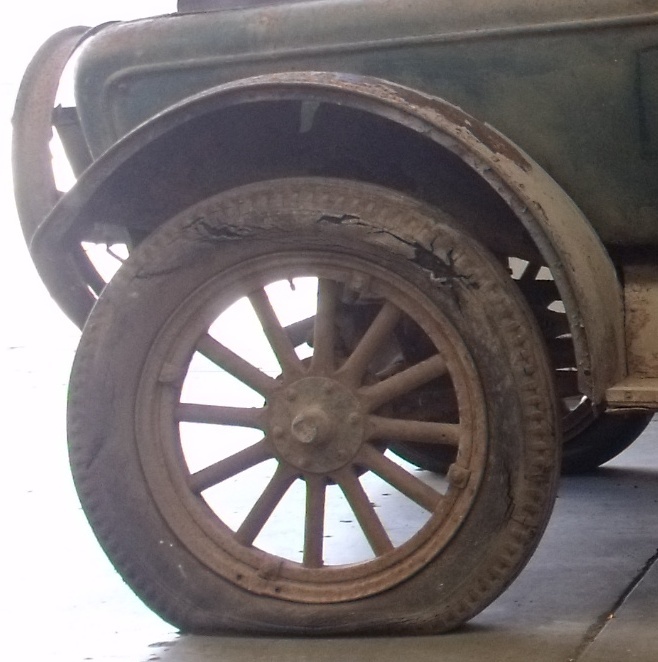 Someone is going to have a very rare Model T.
I hope it gets restored. That is a nice find. I'm with Uncle Jack. That's a bit too much "patina" for me. I hope someone buys it and restores it to its former beauty. I really like the lines of that body. It's a beautiful design. Dear Hap, I will do my best to answer the questions, and others that have arrived through private messages. Who sold it? Duncan Motors Limited. In October 1920 the South Australian state distributors Duncan & Fraser Limited annexed off the Ford agency as directed by Ford Motor Company. From this date forward all Fords in SA were sold by Duncan Motors Limited. Where his gets confusing is Duncan & Fraser built all the bodies, "sold" them on paper to Duncan Motors and the completed cars were sold by Duncan Motors. This is why there are no Duncan & Fraser badges on the standard Fords. The "deluxe" tourer or roadster was offered at an extra price with all of the trimmings such as plating, colour choice etc. On the door sills are the only place where you will find the name Duncan & Fraser. Once a "deluxe" was completed to order it was sold through the Ford agency Duncan Motors. I hope this is not to complicated. 4.50 x 21 wheels. I have a better photo and have attached it below. I have seen a couple of sets of these wheels before, but not too sure as to the date. The set we had came from a late Dalgety, we thought were 1926 and scrapped them! John Scoorgie's 1925 Coupe has them, as does another late Dalgety here. I am very interested in learning about these wheels. They have removable lugs. Hello fellows. I have to report that the car has been sold. I brought it home today! Richard first. Patina is a bit too good a description to describe the condition of the car. The body will need to be re-wooded and much of the lower panelwork replaced. However, if you can create one of your wonderful artworks to show her off, I would really appreciate a copy. Hap, you are spot on with the wheel/rims observations. They are indeed Canadian 21"loose lug rims. I have seen very few of them in Australia. The spare is a Chev rim. The valve hole is close to the slotted lug, the split in the rim is close to the valve hole rather than opposite like the other 4. I have a nice set of 23" Hayes wire wheels and rims with new tyres in store for it. The 21" wooden wheels will be put aside to keep it all intact. The car has been crudely painted blue, with what might have been a broom. There are places where the blue has flaked off, revealing the remains of some faded green. There are better samples of the colour in the door jambs. It was originally a khaki green, but I can't ell if the fenders were also green. I would like it to have had a fawn canvas top, but the remains showing in a couple of eyelets on the top mounting brackets show black top material. I have always wondered what happened to the D&F roadster which belonged to our T club first president. It went to Sydney in 1988 on the Bi Centennial rally and it seems to have disappeared. I would love to have found it, but this will have to be a good second best. I will keep you all posted once I get started. I have a few jobs to get done before then, including selling on a couple of other projects. Well done Allan, I am so glad it has gone to a good home. I forgot, Alan White's old 1921 Duncan & Fraser roadster now lives just outside of Sydney and is a member of the Model 'T' Ford Club of Australia NSW. I last heard of it on the Bi-Centennial Rally too. 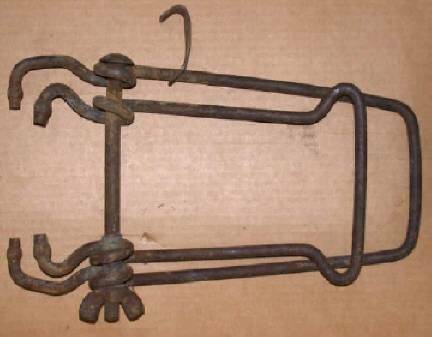 Here is a photo of it when it was found by Ian Todhunter in a stone barn behind the local butcher's shop at Mount Torrens before Alan bought it. Photo courtesy of the late Ian Todhunter. 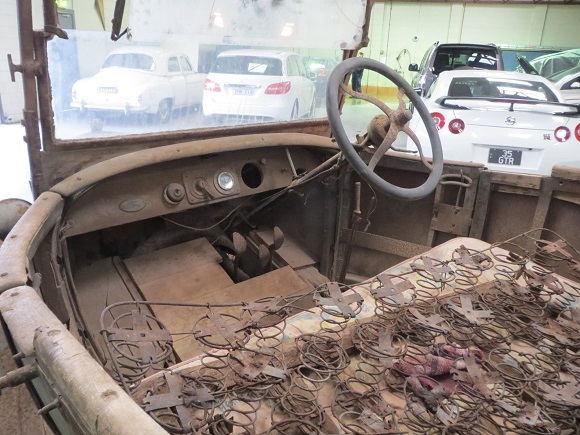 Wow Allan, Two unrestored barn find projects taken on in less than a year. You are going to be a busy boy. Would love to see a picture of the Tarrant and the Duncan & Fraser together. Some real Aussie Ford history now living at your place! Congratulations on taking the roadster on. I'm so glad you are the new "steward" as I know the car will be well taken care of. Ref the top color, any chance that was a replacement top from back in the day? I would think the customer could have ordered any color top with the deluxe model. And even if they originally requested black, I would be very tempted to go with the lighter color tops that are also documented on the Duncan & Fraser cars. Ref: David Chantrell's book "Duncan & Frasser Ltd. "Legacies Left Untold" [cover 1915ish cars and pages 107 showing light color tops on 1918 touring and roadster; 1921 touring page 133, 124; 1922 cars page 137. After the fire -- page 168 showing the 3 bolt windscreen and light color tops. Also page 172. Page 209 11 light colored tops on tourings. And if you do not have a copy of his book -- I encourage you to contact him and locate one. For example -- David commented your car has the oval gas tank. 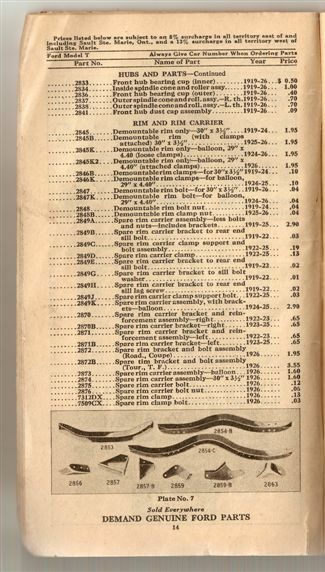 In the book on that same page 209 he shows an assembly area with the comment: "...early 1925. The Fords are standard Duncan Motors Ld.bodies being fitted to oval tank chassis, as the square fuel tank did not appear until Jul 1925." That would be another item to date your car before Jul 1925 assuming the tank is original to the car. Again congratulations on your new very unique Model T. We look forward to learning more about it as you uncover new items. Thanks for your kind words Hap. It is my understanding that the square tank was introduced in the standard bodies made by Duncan and Fraser for the 1925 year model cars assembled by Ford in the Geelong Dalgety woolstores, prior to the opening of the Ford plant and the production of the improved cars for 1926. The square tank was needed to get back some of the fuel tank capacity lost when the body profile was lowered and the oval tank would no longer fit. There is one Duncan and Fraser special build standard tourer on which I have done a lot of restoration work. It has steeply raked seat cushions front and back, so it too had fuel tank capacity problems. This 1923 car has a square tank, with an extra drop section between the frame rails. 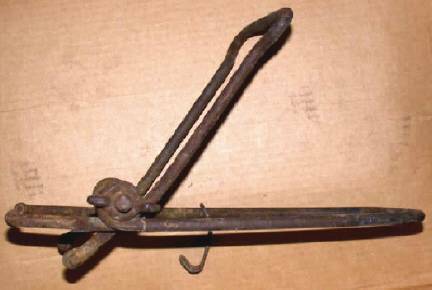 This means a Stewart vaccuum tank was needed to draw fuel to the motor. So D&F had previous experience with square tanks. The cars shown in David's book on page 209 are standard bodies with oval tanks, but they are not the Dalgety type bodies requiring the square tank. The Dalgety cars have no filler board between the windscreen and the cowl, the screen following the curve of the cowl. The cars in the photo have a filler board, with a slight curve on the bottom of the timber. This is typical of the 1924 model cars, perhaps still being produced in early 1925. Congratulations Allen R B! That is a wonderful car. I really like those "Southern" Ts. Hap, another new item discovered, maybe. David's photo of Alen White's roadster prior to his ownership shows a wooden running board box, presumably to house the battery. My car has no battery carrier bolted to the frame. There are two neat holes in the valence through which the battery cables pass.Presumably, the bodywork prohibits access to the battery if carried in the usual place. It would end up under the fuel tank. David's photo of the original type box is appreciated. We have found another one locally, and it is quite interesting. I found the body number for mine on the underside of the wooden trim pieces on top of the doors and cowl, rather an inconvenient arrangement. Son Anthony found a second car, a roadster just like mine, and its body number is 137, just 23 lower than mine. Its number is on the timbers under the seat, so I went digging in the same place on my car and there it was too. Of extra interest is the close relationship between casting dates and engine numbers. Mine is engine no. C5xx533 with a casting date of 9-26-A. This puts them into a late 1924 slot according to published data. Briefly, September 23 castings, late 24 engine numbers, early 25 cars, prior to Duncan and Fraser getting into the production of bodies for the Dalgety tourers. I suspected that the jacked up windscreen on my car was not correct, and that on this new discovery confirms this. Both pillars on my car had been roughly repaired and the windscreen fitted was a crude adaption from an earlier car. The pillars on the new car show signs of repair also, but they are much lower and the windscreen is a one piece. I have now just finished making a new frame for the glass for my car and it awaits nickel plating. The original pillars were plated, a little of the plating remaining under the mounting bolts. I have photos of this new discovery in my phone, but have no idea how to post them here. Perhaps I can post a separate post to show them. Hope this is of interest, especially to you Hap. Can't wait to see more Allan. Always stuff to learn. Thanks for the update! I seem to have become fascinated by the "Southern" Ts. Even though I will never likely get near one. That's a great looking body style! It would really be a neat T. Its amazing the car wasn't taken apart or parts robbed off of it. If had been in the states some hot rodder would have jumped on it and messed it up long ago. Positively amazing to be sure! It just goes to show that a real unmolested Model T can still be found. They are out there but getting harder to find. To me this is the best looking aftermarket body style that was produced for T's. To me what would be interesting is a comparison between Ford factory top bows and the top bows that came with the aftermarket bodies like this. That could be a chore in finding or reproducing the correct top bows that came with this body. Good luck Allen with your great find! For John – Australia had a unique Model T Arrangement. It is a little complex, but initially there was not a Ford owned / controlled Assembly Branch in Australia. It was not until Mar 31, 1925 that Ford incorporated two companies, Ford Manufacturing Company of Australia which was set up to operate the body manufacturing plant. The second Ford Motor Company of Australia Pty Ltd. managed the assembly plants and marketed Ford’s products. (ref page 39 “The History of Ford In Australia” by Norm Darwin with the Model T section written by Peter Kable (thanks Peter for all your support to our hobby for so many years!). Prior to that “official” Ford controlled group there had been several different non-Ford controlled state distributors and country dealers. And they initially offered Ford of Canada supplied bodies or their own “colonial body.” But as a result of WWI shipping issues Australia changed their import regulations/Tariff structure to help bolster their local industry. It prohibited the importation of luxuries (page 16 – Darwin) and a car that came with a complete body was classified as a luxury. In 1918 it was changed to one fully bodied car could be imported for every two chassis. But the result was Australia became independent of Canada for bodies. The local body builders flourished with many of the Australian State distributors either building their own bodies to be assembled and sold with the chassis or purchasing bodies from another body builder. So technically I think those Fords assembled in Australia starting in 1917 – had a locally supplied body but it wouldn’t be an accessory body as we think of the Ames, Autowa, etc. bodies that were sold in the USA. They were the bodies that came with Fords in Australia. And there were several major state distributors with their own standard and deluxe bodies. And there were exception to that also – as Ford enclosed cars were allowed to be imported. Allan -- some folks like to work cross word puzzles but I prefer trying to piece together information about Model Ts. Thank you so much for the update! Note there could be 2 or 3 known Post Fire [in Feb 21, 1923 there was a fire that destroyed most of the factory] Duncan & Fraser Deluxe Roadsters. You have the one shown at the beginning of the posting. Your son has located another one. And David Chantrell mentioned at the beginning of this post: “Post fire Duncan & Fraser Ltd. “deluxe” bodies are rare. Until this Tumby Bay car I knew of only one other. Ironically that too is a roadster.” So unless the roadster you son found is the same car David new about – there are now three known post fire deluxe D&F roadsters. If you would like me to try and post some photos for you feel free to e-mail them to me and I will do my best to get them posted onto this thread. If you click on my name at the beginning of this posting it brings up my profile. My e-mail address is the third line down. Especially please send or post a photo showing where you found the body number(s). That should help others know where to look in the future. Your verbal description was good – but photos make it so much easier to understand. And between the cars you can compare as well as possible early photos hopefully you will be able to reconstruct any missing parts. So does the future hold a father & son road rally with both of you having a post fire D&F deluxe roadster? Again thank you so much for the update and we look forward to learning more about the cars. And for David Chantrell if you read this – Reference the photo you posted above of Alan White's old 1921 Duncan & Fraser deluxe roadster when it was found. Would you please confirm it is a low radiator car with a 1921ish engine etc? 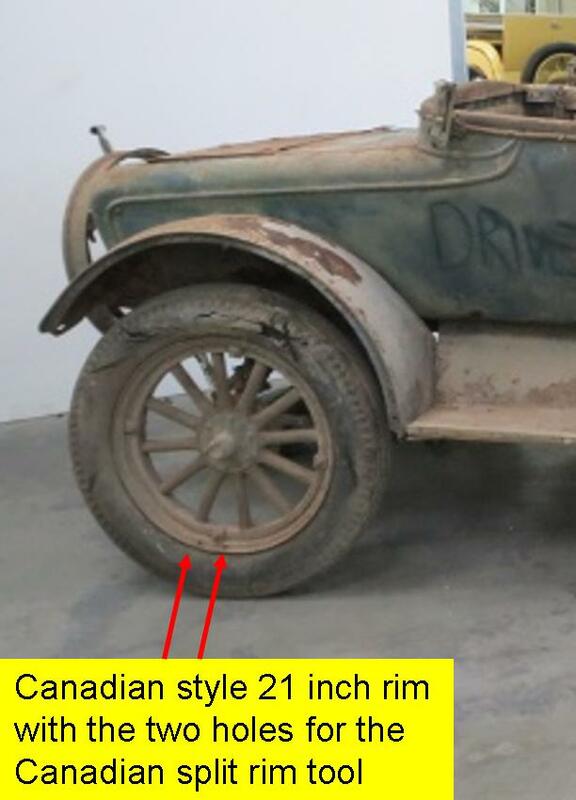 The balloon tires would make me think 1924-25 per the posting above on the lose lug balloon tires in the Canadian Price List of Parts. But as you mentioned in your book the bodies are basically the same except for the cowl being modified to fit the slightly higher radiator. The Alan White car is a 1921. Allan Bennett knows the car well as he was there in 1964 when it was first rallied when the Ford 'T' Club was founded in February of that year. Rims are standard 30 x 3.5". 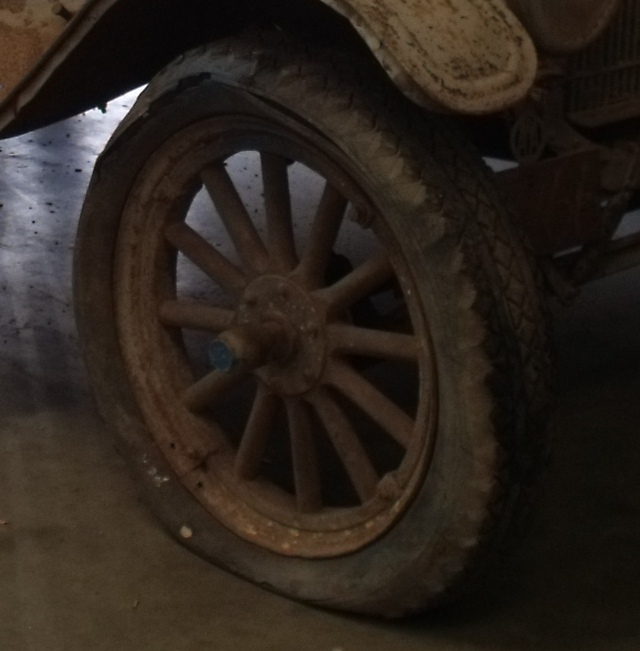 Tyres became hard to get after the war with the Ford 'T' size being one of the few that were available in some description or other. Thank you for confirming it was a 1921 low radiator and for pointing out that it has the 30 x 3 1/2 tires. I guess I better get those new glasses I've been thinking about. The wood mostly used here is Queensland Maple. A timber you probably have never had contact with. Ash was also used. The qualities of Queensland Maple makes it ideal for use on timber frames for cars. When researching I found an article which mentioned the Australian timber industry and it was commented on that until the need for a good timber was needed for the motor vehicle body industry Queensland Maple was regarded as a "waste timber" unsuitable for any real purpose. One of the periods well known body builders and designers Arthur Smith who my father worked with was asked once why so many of the Rolls Royce's he built went to India He replied "because the timber we use here is so superior to that available in the northern Hemisphere, our bodies last far longer". More on timber in Australian T's. Duncan and Fraser built standard bodies were framed with what we now call Meranti, a timber imported from the islands to the north of Australia. Meranti is a collective name for a number of species. Phillipine Mahogany is another. I was surprised to discover this. By putting some original pieces over my planer, the pinkish tinge to the timber and the grain structure was exposed. My roadster is a different kettle of fish. Incorporated in its construction is some Accacia Melanoxylon, a native Australian timber commonly called blackwood. This is a high quality cabinet making timber usually. It responds well to steam bending, and I will post pictures of the unusual way it has been used in the making of this body when I get the body off the frame. For Wayne and Hap, the link you gave to the Duncan and Fraser bodied car in the US shows a standard bodied car, a cut down tourer. This is not the special wide bodied car like my roadster. Still a very good quality body, so much so that D&F were selected as suppliers to Ford for the 25 Dalgety bodied cars. The story goes on. I will keep you posted with progress reports. More on timber in Australian T's. Duncan and Fraser built standard bodies were framed with what we now call Meranti, a timber imported from the island to the north of Australia. Meranti is a collective name for a number of species. Phillipine Mahogany is another. I was surprised to discover this. By putting some original pieces over my planer, the pinkish tinge to the timber and the grain structure was exposed. Allan, I think you will find the timber you are calling Meranti is actually Queensland maple. Both are pink in color but Meranti is a timber only recommended for decorative finishes such as skirting, mouldings and panelling and I don't think there was much trade with the Phillipine's in those days. Queensland Maple is and was used for airplane propellers, coach work and boats, a far better timber. Obviously other timbers could have been used and were. One of our members in NSW swears his was made from red cedar ( a soft furniture timber) but from the complaints often noted in the day by Ford owners a lot of the bodies were made out of poor quality timber to keep the cost down and profits high. Could be Duncan and Fraser got the Ford Dalgety contract because they did use the best timber available. Absolutely beautiful. Wish we had the different bodies such as you built in Australia. Looking forward to seeing lots more of your fantastic Ts in Warragul in 2016! Peter - Found a propeller in california made with what I now know to be Queensland maple. Was given to my father in Brisbane during WWII. The quality of the timber is magnificent. the time you took to answer what I would suppose has been answered many times. THANK YOU again and Have a Happy New Year. Peter, I need to see some Queensland maple. I am not at all familiar with it. Your proposal makes sense. On the topic of wasteful use of timber, when I was in Townsville on National Service in 1969 the army sent me around to get off-cuts to fire a Wiles cooker while on exercises near Ingham. They were milling 4 x 1.5 s for ceiling timbers in Silky Oak!!! I got cheeky and asked of they had any red cedar. The result was two pieces 10" x 1.5" and 9 feet long, cut from a single plank which was split down the middle. I brought those two planks home on the top of my Morris Mini van, along with the chassis and front axle of my 1915 tourer. I still have the timber, waiting to find a good use for it.